While much research has been produced in recent years on how water use and pollution can exacerbate conflict, a new report focuses more broadly on the ways conflict and high-risk situations can affect water systems and resources directly – as well as on the planning, construction, operation, and management of water systems. 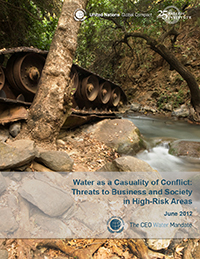 The UN Global Compact and the Pacific Institute released the report Water as a Casualty of Conflict: Threats to Business and Society in High-Risk Areas, in advance of the Rio+20 Corporate Sustainability Forum, to be held June 15-17, 2012 in Rio de Janeiro, Brazil. The new research – which also brings together the work of the UN Global Compact’s CEO Water Mandate, in collaboration with the UN Global Compact-Principles for Responsible Investment Expert Group on Responsible Business & Investment in High-Risk Areas – provides a framework for understanding the nature of water challenges in conflict and high-risk areas and how these, in turn, affect business operations and society. The framework looks at natural resources, physical infrastructure, human resources, and socio-political and financial systems. The report provides examples of impacts on business operations, as well as anecdotal highlights of what companies are doing in response. For example, a large food and beverage company in the Occupied Palestinian Territories worked with local residents and government in the surrounding community to establish an independent wastewater treatment plant that would provide a reliable source of water to its plant, the local community, and to farmers. Varied cases from Peru, Papua New Guinea, Liberia, and Nigeria are included, as well. Water as a Casualty of Conflict: Threats to Business and Society in High-Risk Areas was officially introduced at the “Responsible Water Management Practices in Conflict Affected & High-Risk Areas” session at the Rio+20 Corporate Sustainability Forum, on 18 June, 2012.